Have you found it hard to sell your car after it has been damaged severely in a flood? If you answered yes to this question and you also live in Perth or the larger WA area, you are in luck. Because you have the option of selling your flood damaged automobile to us here at PerthAutoWreckers and get the Maximum Cash for Flood Damaged Cars Perth, WA. Don’t let Mother Nature win. She may have ruined your car, but you can have the last laugh by selling it and getting top cash for cars in the process! If there is one thing that no-one can get away from, it is the natural disaster. Floods happen all over the world, and Brisbane has had its fair share of floods as well. If you have the misfortune of having a flood hit your area, your car will have little to protect it. Your vehicle may be of the highest quality, it won’t make a difference. How damaged your car is will depend on certain things, such as the length of time it was in the water and how bad the flooding was. But here at “PerthAutoWreckers” we buy cars regardless of how damaged they are. So you don’t have to worry about your car being too badly ruined for us to buy it. What Car Parts Need Checking After a Flood? Is the power still working? You may want to switch some things on and see if they are working. This includes the windows, the AC, locks or wipers. Smell for an odour that seems musty. Open up compartments such as the glovebox to see if water got trapped in them. Are there any stains in your car from dirt and mud? Have a look! Some mechanisms can become useless as a result of water damage. This includes the radio, seats, and so forth. Check them to see. Have a look at the interior of your car for any signs of corrosion and rust. Car engines can be ruined by flood damage, so have a look at that too. It may be an idea to take the car for a very cautious test drive. It can alert you to anything else that can be a problem. How Auto Wreckers Can Help You With Flood Damaged Cars? Buying or selling flood damaged vehicles is not very pleasing in Western Australia. No-one wants to be a party to criminal activities. One of which is the practice of selling flood damaged cars as used cars and making more money than the car is worth. Here at “Perth Auto Wreckers”, we don’t have time for crime. We are too busy with our successful Auto Wrecking Business. When we get your car back to our salvage yard, we dismantle it. Any parts that are in good enough condition to be resold are cleaned and tested. Then we add them to our used parts inventory to sell second hand. If there aren’t any parts that can be salvaged we sell the scrap metal. If your vehicle is not good enough to drive after the damage, feel free to let us know and we will offer you the free towing service at the top of paying you the best cash for car. Our Free Car Removal Service work for any condition of vehicle and any type of vehicle including cars, trucks, 4x4s, vans and SUVs. Other than that, if the vehicle is commercial then please mention and we can help you with that as well. We pay the best price compared to damaged vehicle auctions in Perth and always happy to buy repairable write off and hail damaged cars for the decent price. 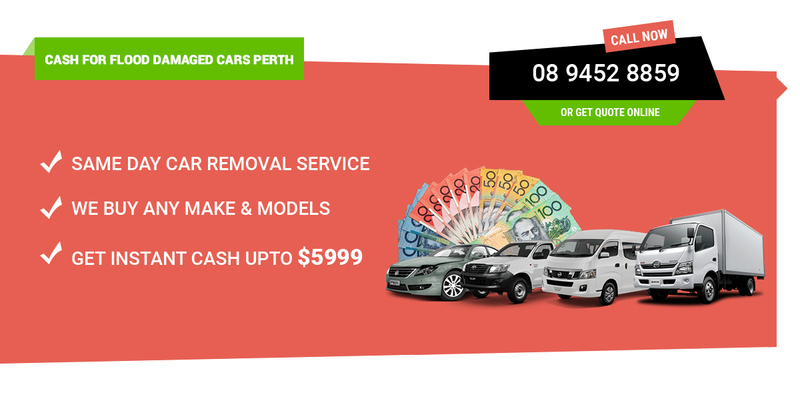 Need Cash for Flood Damaged Cars Perth? Call Now! So if you have a flood damaged car for sale, contact us! The number to call is 08 9452 8859 or fill out the form on our website!